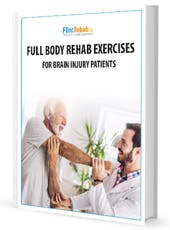 These exercises for brain injury patients can not only help you regain movement and strength, but also improve your cognitive functioning. In this article, we are going to look at how physical exercise helps the brain heal itself, then we will cover some specific physical exercises for brain injury you can do at home to aid in your recovery. Exercising is good for everyone, but it is especially important for people with TBI. In fact, research has shown that regularly performing physical exercises after brain injury is a key factor in reversing the effects of traumatic brain injury. Why is this? Well, there are several reasons actually. Exercise increases blood flow to your brain. When you exercise regularly, this improves your cardiovascular functioning, which increases blood flow to every part of your body, including your brain. More blood flowing to your brain means more nutrients for your brain to receive, which means your brain can function much better! Exercise effects neurotransmitters. Neurotransmitters are chemicals in your brain that transmit messages between neurons. It is basically “transmission fluid” for your nerves. Scientists have found that regular physical exercise actually increases the level of this “transmission fluid” in your brain, making the impulses in your brain travel faster from one nerve to the next. This increase in neurotransmitters helps you process information faster and can even improve your mood and memory! Exercise activates neuroplasticity. Repetitive exercise is one of the best ways to engage your brain’s neuroplasticity, which is the brain’s ability to rewire and repair itself after brain injury. These are just some of the reasons physical exercise is so good for brain injury patients. Now that we know a little bit about the science behind exercise and how it can help with your TBI recovery, it is time to learn some specific exercises that you can do at home to help regain some function. Aerobic exercises are extremely beneficial for brain injury patients. Aerobic exercise is any sustained activity that substantially raises your heartbeat, such as swimming, jogging, biking etc… Research shows that “people with TBI who exercised had fewer physical, emotional and cognitive complaints and symptoms” than TBI patients who did not exercise. You might be wondering how you can possibly do aerobic exercises if your injury is a severe one. Luckily, there are many rehab devices out there that can help you get your heart pumping even if you are not able to walk on your own. These devices let you get all the benefits of aerobic exercise that are crucial to your mental and physical well-being, no matter what disability you have. However, aerobic exercise is not the only type of exercise for brain injury patients. Range of Motion and strength training exercises are also very beneficial. The following exercises are very effective for increasing your strength and range of motion after brain injury. While holding one end of the band, sit on top of the other end and stick your hand (the one holding the band) out to the side. If you have trouble holding the band, try looping it around your hand to keep your grip. Keeping your arm (the one holding the band) straight out, raise your arm as high as you can above your shoulder. It’s ok if you can’t raise your arm very high at first, the key is just to practice the movement. You should notice improvements over time. Do 3 sets of 10 of this exercise on both arms. Turn yourself onto your left side. While laying on your side, bring your toes forward, then open your legs in a scissor motion. Try to lift your leg up about 45 degrees. Again, if you can’t lift your leg very far, don’t worry. Just do as much as you can. Do 3 sets of 10 on both sides for this exercise also. Keeping your toes pointed up towards the ceiling, raise one leg up as high as you can go. Alternate legs to make the exercise go faster. Again, try to do 3 sets of ten on each leg. The next set of exercises we will cover are balancing exercises. These are especially helpful for TBI recovery because they can help improve your coordination. A great balancing exercise you can do is to simply close your eyes while standing with both feet firmly planted on the ground. You may feel your body sway a little when you close your eyes, but that is completely normal! This is because your brain uses your vision to help keep your body upright and balanced. When vision is removed, your brain has to adjust and use a different sense (called proprioception) to help you balance. This adjustment is partly why you find yourself swaying when you close your eyes. You are activating a different part of your brain! That is also why this exercise is such a good one for brain injury patients, because it engages a different part of your brain, which helps activate your brain’s neuroplasticity. Just doing this exercise for ten seconds a few times a day can help greatly improve your balance. Another good balancing exercise is to hold on to the back of a chair and rise to your tiptoes ten times. To increase difficulty, close your eyes for this one too. There are so many good exercises for brain injury patients that we can’t possibly fit them all in one article. But in case you want more, here are some of the best video demonstrations of exercises for brain injury on the internet. Hopefully these exercises are enough to get you started on your road to recovery. Remember, even if they are difficult in the beginning, do not give up! Practicing these exercises daily will help your brain rewire itself and eventually you will find yourself able to do many activities you once thought impossible. Older Learning to Speak Again After Brain Injury & Find Your Voice!